On beautiful Marathon Beach, nestled between the mountains and the sea, the Golden Coast Holiday Club is a peaceful retreat for enjoying sun-soaked days and romantic evenings beneath a canopy of twinkling stars. 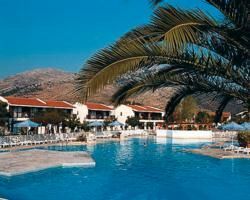 Located near the historic town of Marathon, Greece, in the municipality of Attica, the holiday club at the Golden Coast Hotel and Bungalows is a perfect seaside getaway for family vacations or holidays with your friends. But at this private and serene site, this Greek vacation ownership resort is also an ideal spot for couples who are falling in love, or falling in love all over again. From the golden sand beach to the oversized swimming pool, and the on-property nightclub, this holiday club retreat affords you the chance to relax, unwind, and have fun. Situated near the site of the historic Battle of Marathon (490 BC), the resort is close by the Pine Forest of Schinias, the legendary Cave of Pan, and the archaeological site of Ramnous. The spacious resort property has hotel suites as well as private villas or bungalows, laid-out like a private residential vacation community. 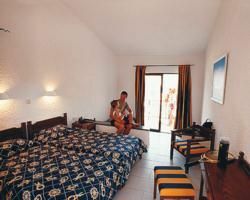 The four-story main building includes over two hundred vacation suites, and over three hundred family apartments (bungalows) of which, there are over eighty cottages reserved exclusively for Golden Coast Holiday Club timeshare owners and guests. With either sea views or garden views, the cottages are situated village-style, along winding pathways within the complex. Both hotel accommodations and studios are designed to sleep up to two vacationers and include televisions, a coffeemaker, and a two-burner portable cooking appliance, but do not have an actual kitchen. The larger bungalows (timeshare villas) sleep up to four vacationers and have a partial kitchen with mini refrigerator, convection oven, four-burner appliance, and sink. The villas are a two-story or townhouse layout with at least one bedroom on the main floor, heating and air-conditioning, a balcony or terrace, and a television. In some units, one or more bedrooms include both a queen bed plus bunk beds. Throughout the resort, most units offer secure electronic door locks, daily maid service, soundproof windows, a safe-deposit box, and free Wi-Fi. The Gold Coast Holiday Club is part of Xenotel Group Hotels. Contact Golden Coast Holiday Club Specialist Today!